Aw, c'mon, Haddonfield, I can't hear you! That's better. For a minute there, I thought half of you were switched off or asleep. (Cue the rimshot. Laughter from the audience) Ohhkaayyy....How many of you here have seen the flick that put Haddonfield, New Jersey on the map? Bang yer hands together! All right! You'll love the line up we got for you tonight, 'cause we went all out trying to get the best "A.I." comedy talent -- Orga and Mecha -- up here tonight, starting off with something I bet many of you can relate to, or which you've accused your best friend, roommate, next-door neighbor, lover, enemy or whatever of doing. The crowd is still laughing hysterically over that, even the M.C. is having a terrible time keeping from laughing herself. Okay...okay...Oh man, that was too crazy, but that's just the tip of the iceberg, people. Next up...Next up we have an exclusive feature. A friend of mine who worked in the camera crew for "A.I." was able to salvage some of the stuff off the floor of the editing room. Alas, he was unable to salvage the extra footage of Jude Law as everyone's favorite love machine (Loud, goofy cries of "WAAAAHHH"!! from the ladies. The combo plays a few bars of "I Only Have Eyes for You")... But... he was still able to sticky-tape together a series of outtakes from the film. Artificial Intelligences at their least intelligent. 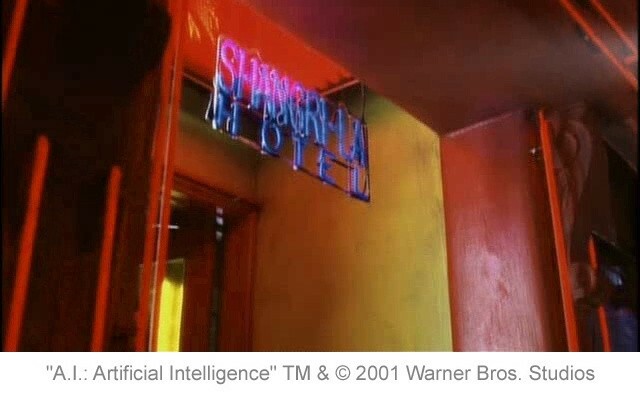 And so we present... the parts of "A.I." only Spiels and company got to see. Mark, could you spin that DVD?